I recently finished reading the "War of Art" by Steven Pressfield. The book was recommended to me by John Lee Dumas and others I've been building relationships with in the online world this year. I have to admit it was a great book and I can see why everyone is raving about it. Since I took the time to read the book I thought I should share with everyone a few things I learned from the book. I know this style or type of book might not appeal to everyone, but I hope through some of things I've learned and share here with you it might at least open your eyes to what this book is all about. This book is all focused on "Resistance" in your life and how to overcome it. I'm sure you might be thinking to yourself right now how can anyone write a book, let alone have enough to say about resistance that anyone would want to read? I have to admit I was a little skeptical myself and that's probably why I held off reading it for so long. Boy was I wrong, I should of read this book a long time ago. So let me give you a few (believe me this is only the tip of the iceberg there is so much more to this book that I could probably do 50 posts and still not cover everything I learned from this book.) of the gems I learned from my time reading the War of Art and what these little gems mean to me. Have you ever felt that the life your living now isn't the life you're supposed to be living? Have you ever felt that what your doing now isn't all your life is supposed to be about? Have you ever felt that what your doing this very second isn't what you were put on this earth to do? If you can answer "Yes" to any of these questions then tell me why your not doing what you feel and know you should be doing? Let me take a few guesses as to why you're not. Save your excuses for other people who don't want you to ever achieve anything in this life. Believe me you know those people in your life they are everywhere. So if you want to stay where you are today keep making excuses, but if you want to live the life you know you were meant to live decide today to stop making excuses. It's really that simple. Be responsible for "You", and your choices, and let's start living the life you're supposed to be living. It is often said the greatest battles we will ever fight in our lives will be the battles we fight inside of ourselves. These two quotes above not only let us know that Resistance is real, but that indeed it is a battle from within each of us. So if you don't believe that resistance isn't a problem for you, or if you think it is going to be something easy to over come you would be wrong on both accounts. Acknowledge these facts, and know they are real, for once we know our enemy then we can begin to defend against it. Once we can start to defend against an enemy then we can learn how to destroy it. I think this quote from Steven says it all. If "You" are not willing to master your own internals battles and strive to be the very best person you can be, then there will always be a master besides yourself who will govern over you. Whether that is Resistance, Fear, Bad Habits, or an outside Boss, "You" will never be in control of your own life. If you want to be in control of your life then you need to "Do The Work". There are no short cuts, no snooze bars, no silver spoons, no easy buttons to push, you need to do the work and fight for what you want in your life every day. The choice is yours every day... Do "You" control your day? Your life? Your outcomes? Or do you succumb to Resistance and Fear and let someone else tell "You" what to do? 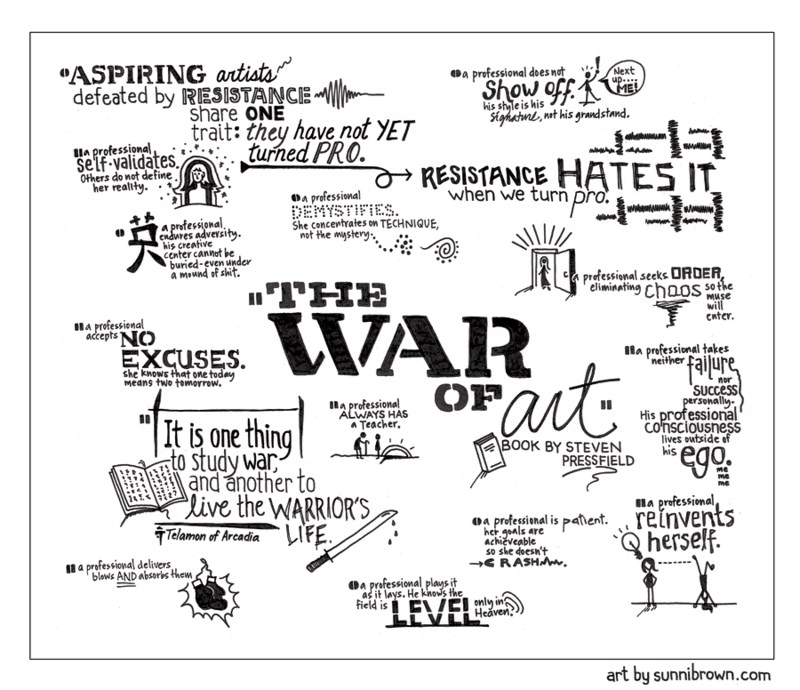 *If you'd like to pick yourself a copy of the War of Art up at Amazon please click on the book below. Thank You Carla!! I'm glad you enjoyed the piece. Any comments or recommendations on how I can make things better next time?